Woodblock printing is a technique used for surface decoration where a mark can be continually repeated. 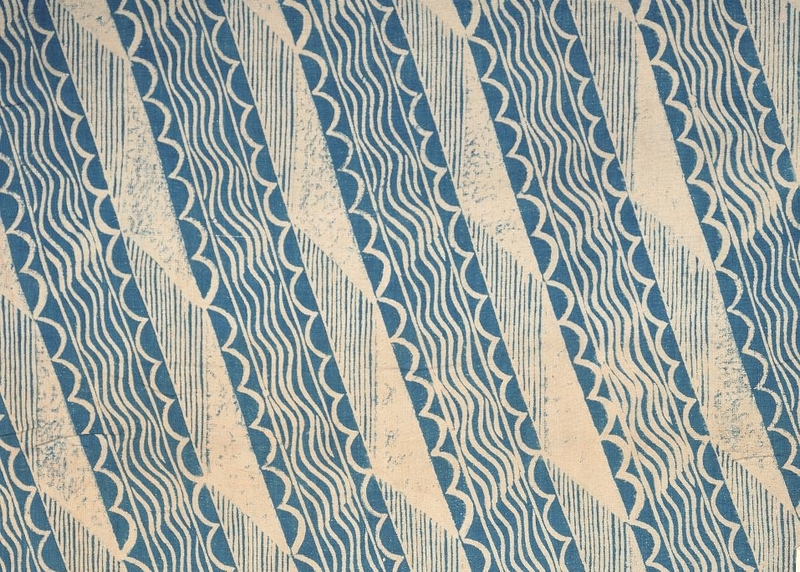 In the UK, Phyllis Barron and Dorothy Larcher were known for their printed designs on textiles in the 1920s and 1930s. The woodblocks were carved with their patterns, coated in bleach and then stamped onto an indigo-dyed linen, where they would transform the pieces from blue to white, leaving its impressions in an organic way. Katie’s practice in ceramics explores this changing state using the ocean as her catalyst. The ‘Scallop’ print by Barron and Larcher was selected because it echoes that environment in its design, colour and changing properties. In particular the idea of transferring pattern on clay held importance, there is honesty that comes with the practice, where the impression cannot be taken back once placed. Coloured clay was slip trailed on paper for this piece and then once lifted from the ceramic vessel revealed the energetic mark marking which was emphasised by the wide, flat surface and its simplistic form.